Mediatek just unveiled the new member of its midrange chipset lineup. 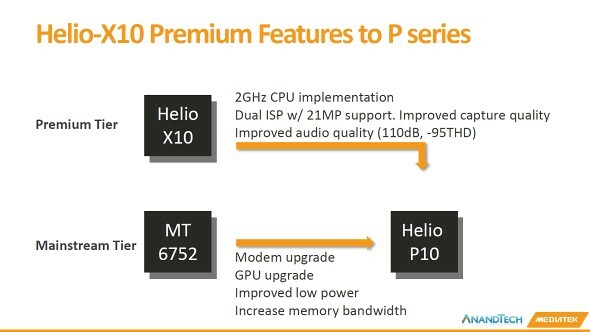 The Helio P10 is set to replace the popular MT6752 SoC, found in the Meizu m1 note, Lenovo A7000 and Sony Xperia C4 among others. The "P" in the SoC model name stands for "premium performance" whereas the high-end tri-cluster Helio X20 denotes "extreme performance". The new chipset relies on a 64-bit octa-core processor, comprised of 8 Cortex-A53 cores, four of which are ticking at up to 2GHz, while the other four are clocked lower, though an exact number isn't specified. 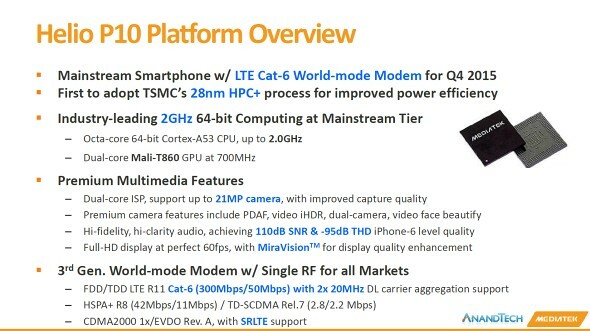 A dual-core Mali-T860 GPU is in charge of graphics. 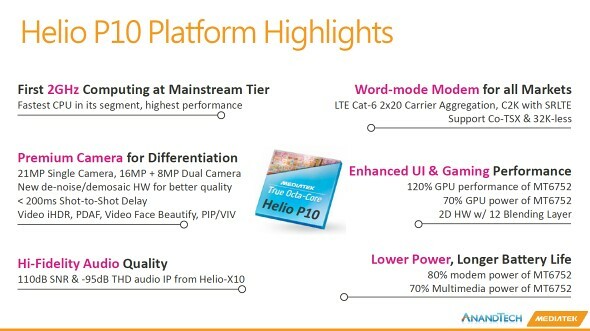 Helio P10 brings Cat.6 LTE for theoretical download speeds up to 300Mbps, versus the predecessor's 150Mbps Cat. 4. We already noted the GPU upgrade, but an increase in memory bandwidth is also highlighted, and speculation points to a switch towards a dual-channel memory controller. Additionally, the chipset integrates high quality audio circuitry which should deliver 110dB signal-to-noise ratio and -95dB of tatal harmonic distortion. Borrowed from the Helio X10 is the support for a single 21MP camera or a 16MP/8MP dual camera setup, coupled with phase detection autofocus. One feature reserved for the "X" series so far is 2160p video recording. What's more, the Helio P10 should deliver its improved performance without sacrificing battery life, as the modem inside is 20% more efficient than the one in the MT6752. Meanwhile, multimedia tasks will be up 30% less taxing on the battery compared to the previous model. The chipset will be produced on a 28nm process and should be available for sampling in early Q3 2015, while entering mass-production is scheduled for the end of the year.